December 14, 2011 | By Paul Mackenzie Ross | Filed in: business, tech. Remember my open letter to PC World back in September? Well they promised to call within 72 hours and I heard nothing. Working for a small business and running another small business on the side has taken up so much of my time this year. From the 4th January until the 5th December I’d taken 3 days holiday – It’s been exhausting and time-consuming and I’ve not yet fully recovered. So I didn’t find time until last Tuesday to finally have another go at PC World/ KnowHow/ Currys/ Dixons Retail. They called back by the end of the day but I missed their call. They left a message so I called back. The member of staff was answering my request to have the issue dealt with at the most senior level and this is what transpired. They *did* apparently call back in September but there was a note against my case saying “Called but customer put phone down”. Now that may have been the wireless phone not sitting in the cradle properly, they do that sometimes, but for KnowHow not to call back? Pathetic. What the “customer service” operative was trying to do now was to remedy the situation – KnowHow would take my laptop back a 3rd time and see if they could repair it again. I said that was not good enough, I couldn’t afford any more down time, so we had this impasse where I wasn’t able to get this laptop finally repaired without being parted from my machine for 10 more days. 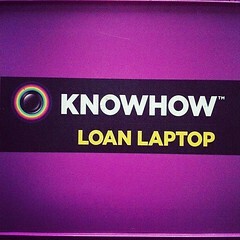 The discussion went on like this for a long time – I wanted the laptop repaired with as little inconvenience as possible, KnowHow couldn’t care any less. I asked for a replacement laptop. They said no. I said I wanted a replacement laptop of an equivalent spec whilst mine was away for repair. They said no. I really couldn’t get any further with this – the customer service person was probably a Taurus born in the Chinese year of the Ox. They weren’t budging. Despite the length of time this has dragged on, despite their complete lack of care and customer service, despite my laptop being still in an unfit state and all becuase they’d failed to diagnose what was wrong with the laptop they’d sold me, KnowHow were unwilling to do anything other than “maybe” try and expedite the repair. You’d think that, having been on BBC’s Watchdog, KnowHow would have been really on the ball. But no. They didn’t know what happened to Rob Hickey’s laptop. An entire pallet of laptops had gone missing (although KnowHow deny this). After 2 weeks and hours of phonecalls he just gave up on them. Sarah Taylor’s laptop, which kept switching itself off, was sent back to KnowHow a number of times because every time it was “repaired”… It wasn’t. They even failed to give her a tracking number to keep tabs on her machine. After 7 attempts at completely failing to fix the notebook each of the seven times, they admitted they didn’t have the knowhow. Michelle Morgan’s daughter’s laptop took weeks to be returned. Each time she called she was given a different delivery date. 5 weeks later they returned the wrong laptop – Who had her 14 year old daughter’s laptop?! So, back to my laptop. This phone call with the senior customer service person wasn’t going anywhere. They asked me what I wanted and I said I wanted my machine to be repaired with zero downtime and quickly too because this had dragged on for nearly 6 months and I wanted to have the machine 100% for when I travel at Christmas. Our “friend” at KnowHow wanted to assure me that I would only get what I was entitled to. I reminded them that I was actually entitled to decent customer service and for the laptop to actually be repaired, after all, whilst they’d replaced the faulty keyboard and given me a new AC power pack, they’d not only scratched the 17″ screen but had failed to diagnose the power problem correctly. As you know, the device became unusable as a portable device and couldn’t be moved from a desk at home for fear of complete power failure. Finally, they budged. A little bit. They said they’d try and get me a loan machine whilst they took the HP back. I’d already stated an equivalent spec machine. I was happy that they were finally doing something. And they sent me… a bottom-of-the-range Compaq – 2GB ram, 15″ screen, Deepfreeze software to delete anything I put on the hard drive every time it’s switched off/booted up. It’s actually a lower spec than the old 2007 Compaq of mine that I’d brought back from the dead with a new hard drive! Useless. Totally useless. KnowHow are a complete stitchup! I will never shop at PC World again and I would advise anybody to think twice about shopping at PC World, all because the KnowHow arm of the business is appalling. It’s no fault of the PC World staff themselves, they were pleasant and helpful, but the KnowHow crew were just completely out of their depth. Mark my words – I don’t have a problem with anybody making mistakes or getting things wrong, that’s all part of human nature and a vital part of the learning process. But for a large company with an “exciting” business strategy, financial clout, a big pool of resources etc to get this SO wrong just beggars belief. So, if you’re thinking of getting a laptop from PC World this Christmas, also consider taking a look at ebuyer, Scan or go direct to the Apple Store. The KnowHow saga continues. I cannot use their useless loan laptop and when the driver picked up my machine and dropped off the other one, he said he’d see me in 7 days. Let’s see what happens, aye? Thank you for your report I will never go to PC World ever! Very interesting.I currently have a problem with Currys and will try emailing Sebastion James to see if this will resolve the matter, although I am doubtful after seeing all the complaints on their facebook page. I am interested to know if your unending problem was resolved. Many thanks Alex.